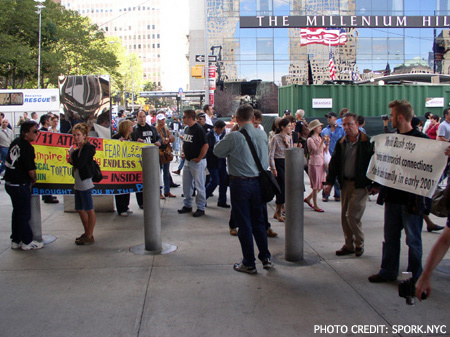 This year, 2006, the 9/11 memorial day at the World Trade Center site was unlike any seen before. 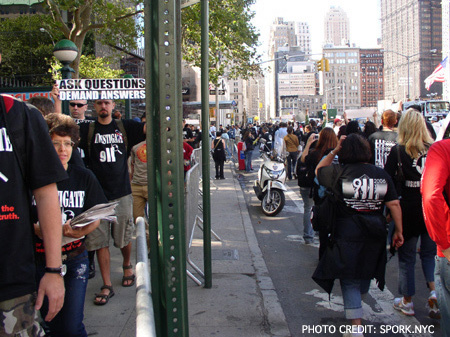 Hundreds and hundreds of 9/11 Truth Activists came out to show their numbers and take part in a protest action that shows the way for successful direct action. It was truly an amazing day. 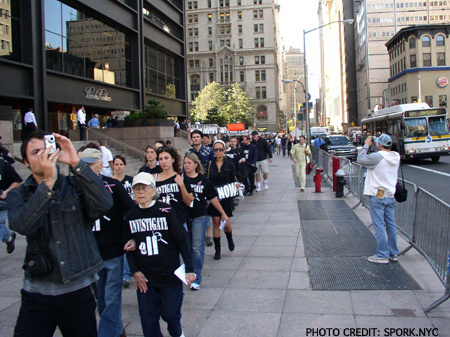 Wearing black t-shirts to show solidarity and strength in numbers worked beyond expectation. 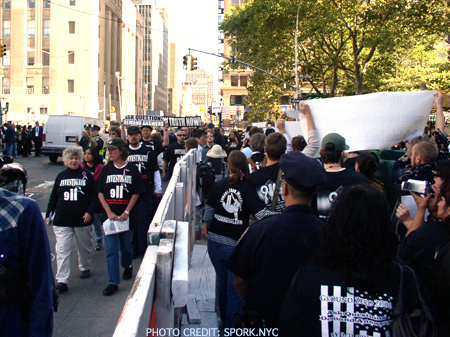 Even though many independent truth activists were present and chose to remain undercover in regular clothes. 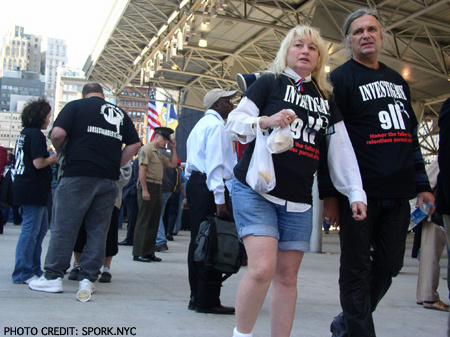 Most of the t-shirts said, "Investigate 9/11" and were provided as part of a three day 9/11 Truth convention that culminated that day. 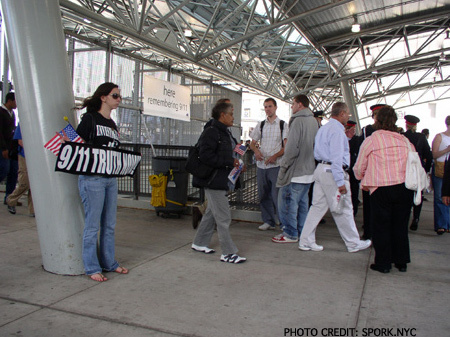 The effect was impressive, one passer-by was heard reminding his friend that one third of the US population now polls as believing some sort of "conspiracy theory" about September 11th. The variety of actions that day was also something to see. Most of the day people in black dispersed in the area and engaged in public outreach. Many visitors would take the time to stand around and have in depth conversations. The level of knowledge displayed in these conversations was often surprising. This continued even during the morning march and the afternoon rally. 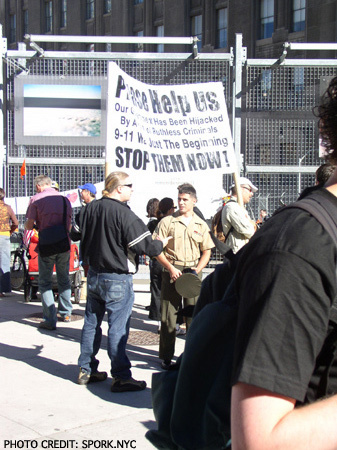 Many activists brought their own signs and printed materials for handing out. The Loose Change creators were on hand with thousands of free DVDs. 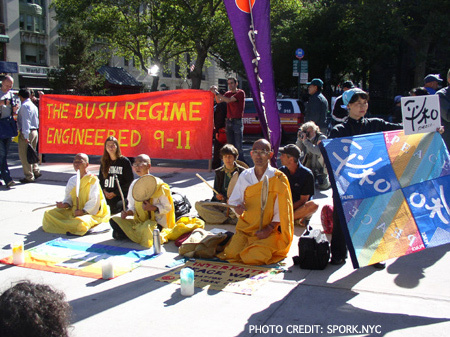 Some activists also took time to sit in meditation with the interfaith peace vigil. Enough cannot be said in this brief article about how the events of the day truly were a breakthrough in so many ways. 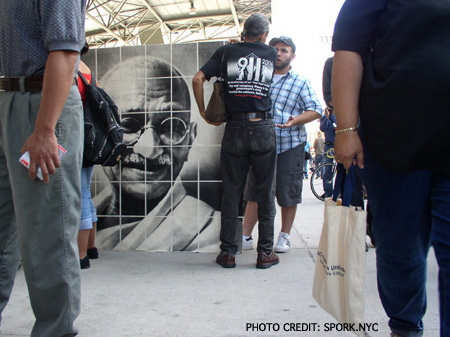 Everyone worked together beautifully in the spirit of peace and nonviolence. But then, those that were there will know. 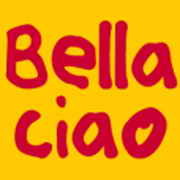 hmmm, still figuring out the system here at Bellaciao. 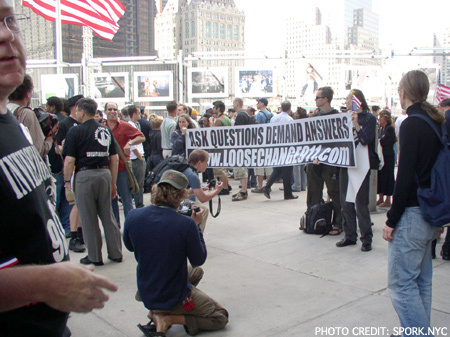 It was wonderful to witness the crowds who turned out at Ground Zero to ask the myriad of questions that the 9/11 Commission failed to ask, answer, or refused to even consider. It was the cowardly attitude of the Commission, and the weasels within the US mainstream media who dishonor and disrespect the 2947 of our people who were murdered that day. May America and the world thank Alex Jones and everyone of courage and conviction who haven’t been taken for a ride by the spin machine, have seen through the lies, and are trying to do something positive to halt the slide into a new world disorder. Here are my photos, feel free to use them anyway you wish.